20th Annual B&GC Auction: It’s for the kids! 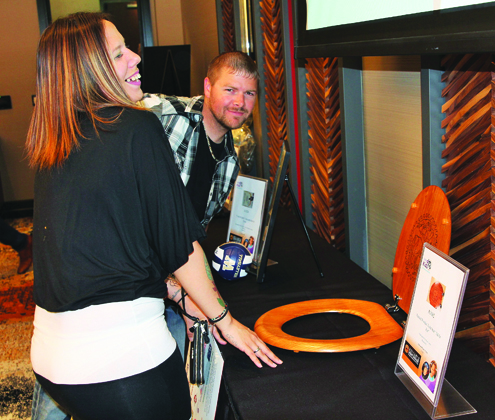 During the evening of Saturday, May 19, the Tulalip Resort Casino’s Orca ballroom was home to the 20th Annual Tulalip Boys and Girls Club Auction. The annual fundraising event is all about giving donors and community members the opportunity to take action for the benefit of countless kids and support the Tribes’ local Boys and Girls Club. ‘The Club’, as it’s affectionately been dubbed by the hundreds of children who attend daily, is a safe place where children can just be kids. At the Club, children make relationships that can last a lifetime, are exposed to healthy food choices, and create an abundance of happy memories. The Club is the first of its kind to be built on tribal land in Washington. Established in 1995, 2018 marks twenty-three years of commitment to the community. Through before and after school programs, it aims to help young people improve their lives by building self-esteem, developing values, and teaching skills during critical periods of growth. Serving as a model for those working to improve the lives of young people in the surrounding communities, the Club is the primary beneficiary of the annual fundraising auction. With each auction building off the success of the previous years, the Club has not only been able to sustain services, but to complete much needed campus expansions that add additional learning and activity space. Funds raised from this year’s auction will make it possible to add a 5,000-square-footextension to the existing Boys and Girls Club building to better accommodate an ever-growing membership. Funds raised from the annual actions are dedicated for capital improvement, not operating costs. Previous auction funds have paid for a state-of-the-art music studio, a multi-media room with twenty-plus computers, several transportation vehicles, a new roof, and upgraded kitchen equipment. “Like past years, the funds raised from [the] auction will ensure that our Club not only continues to provide, but improves upon, quality programs in a fun, safe, and positive environment for the children who attend,” stated Samuel Askew, Auction Co-Chair. 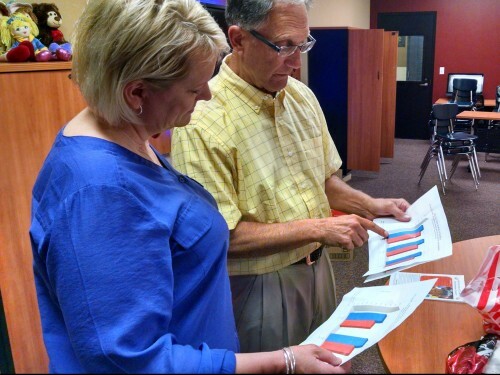 “We’re making great impacts in the lives of our kids through support and program expansion. There were over 700 caring and generous people in attendance at this year’s 20th annual auction. With such an amazing turnout to support the kids came some thrilling fundraising numbers. Over $67,000 was raised for Kids Kafé, which is an essential part of the Club’s services. Kids Kafé addresses the very basic fact that often the meals provided to club members are the most nutritious part of their daily diet. This year, Kids Kafé served hot meals and healthy snacks to approximately 385 kids each day, which translates to 2,500 meals per week and 123,000 meals per year. In total, over $400,000 was raised between the silent and live auctions, including the enormous amount of support for Kids Kafé. On behalf of the Tulalip Boys & Girls Club, the Tulalip Tribes thanks everyone who contributed to the success of the 20th annual auction. The generosity and heartfelt support received each year from sponsors and volunteers is overwhelming. As in years past, the funds raised from the auction will ensure that the Club continues to provide and improve upon quality programs in a fun, safe and positive environment for our kids. 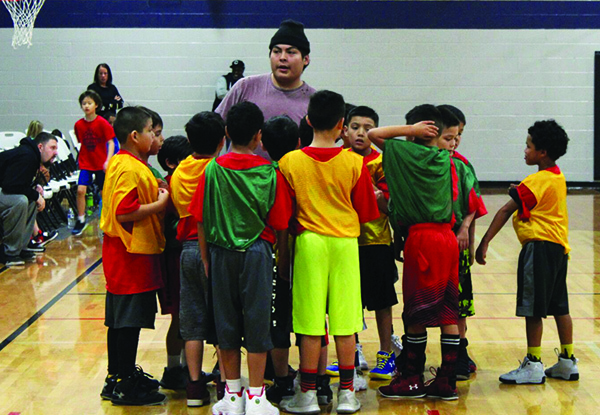 “I always tell the kids, the number one thing you should do while you’re on the court is have fun,” expresses Tulalip Boys and Girls Club Athletic Director, JP Miranda. Currently in mid-season, the Boys and Girls Club athletic program is teaching the Tulalip youth the fundamentals of basketball. 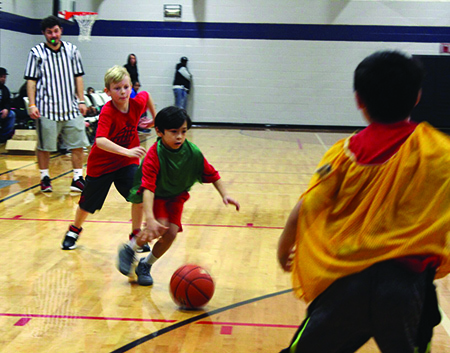 The Tulalip club participates in an eight-week long basketball season in which they compete in weekly games against nearby Boys and Girls Clubs such as Arlington, Granite Falls, Everett and Mukilteo. The Tulalip league consists of eleven teams starting with a co-ed kindergarten team. With the exception of the kindergarten squad, every team is based on which grade the child is in. The teams begin with students who are in the first and second grade, a boys’ team and a girls’ team respectfully, and range all the way up to seventh and eighth grade teams. 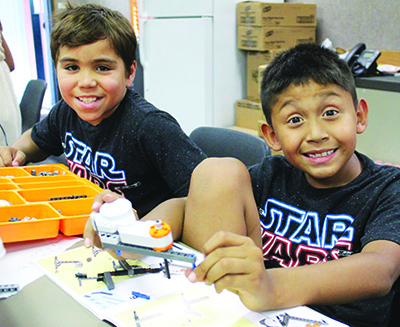 Due to popularity, there were enough participants this year for an additional team of boys first and second grade students as well as boys third and fourth graders. 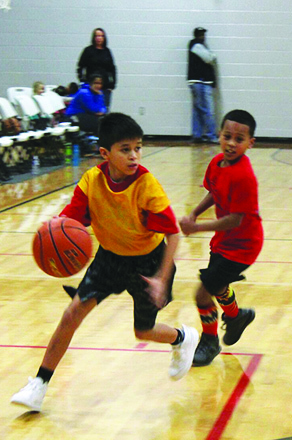 Throughout the season the little ballers learn the basics of basketball. While the younger kids learn essential knowledge and skills such as shooting, passing, dribbling and rebounding, the older kids work on plays, footwork, screens and cuts. All the kids however, learn the importance of defense, communication and accountability by learning how to play as a team. “It’s the fundamentals they have to know, even in the NBA they still practice the fundamentals,” states JP. “The biggest fundamental I stress is dribbling. If you’re not able to dribble, you’re not able to get the ball down the court the right way; you’re not going to be able to get set up, pass or shoot. “The more you practice, the better you get,” he continues. “I like watching them grow and watching them excel on a team and realizing that being part of a team is fun. You have to be able to work as a team to get anywhere. JP states that although attendance during home games is great, the kids would greatly appreciate more support at away games. For more information and to find out how to become a volunteer, please contact the Tulalip Boys and Girls Club at (360) 651-3400. 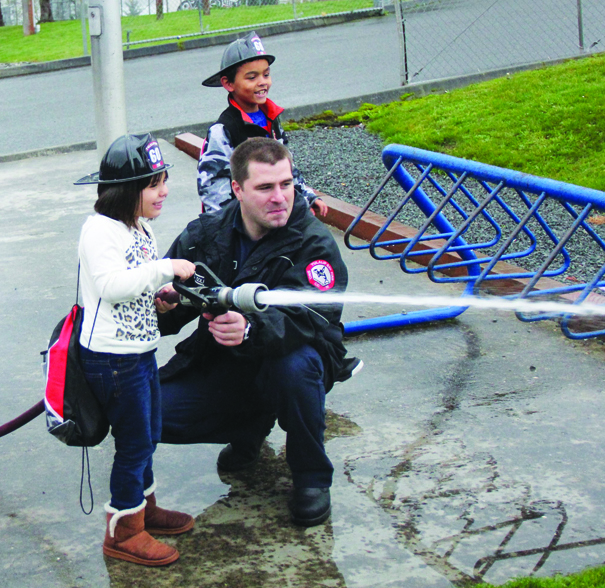 Snohomish County Fire District 15 firemen thrilled the kids with blasting firehoses. 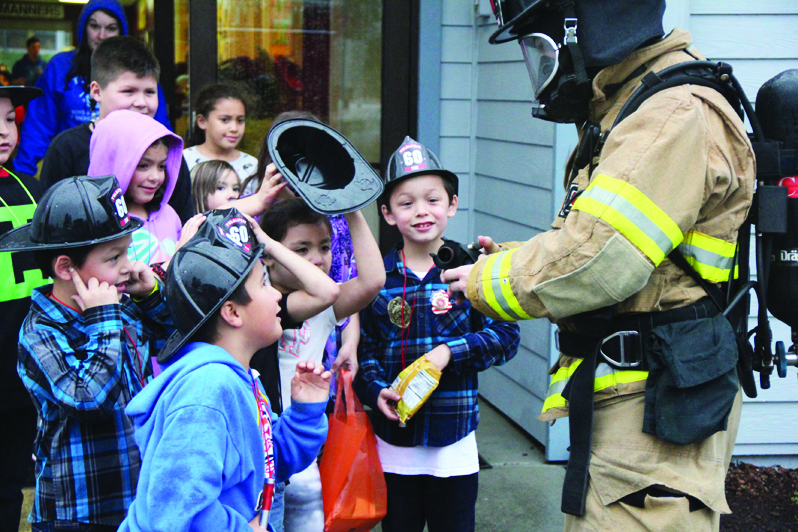 Hundreds of kids from the Tulalip Boys and Girls Club learned how to be prepared for emergencies at a health and safety fair held on Friday, November 13. 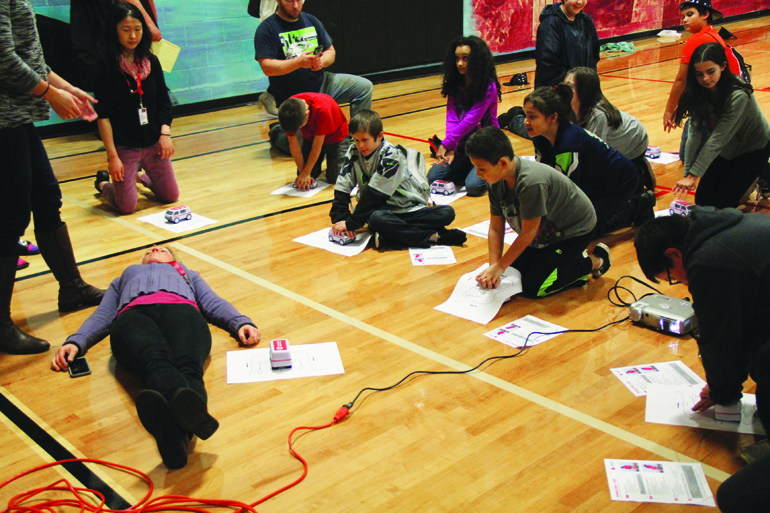 The day of fun-filled, educational activities was in response to a large wind storm that knocked power out in major parts of the Tulalip Reservation only weeks ago. The fair included services and education from various departments within the Tribes’ network, including the Health Clinic, Police Department, and Youth Services. 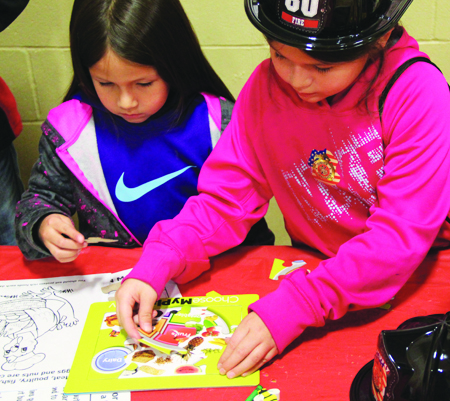 The theme behind this year’s safety fair was to have children and their parents prepare for emergencies with educational fun for the whole family. The Red Cross was on hand to oversee their ‘pillowcase project’, where kids ages 3 and up receive a pillowcase to build their own personal emergency supplies kit. Kids 5 and up were taught compression CPR by a professional team who provided video tutorials and hands-on learning tools for the youth. Washington Poison Center representatives were on-hand with their Mr. Yuk mascot and resources. 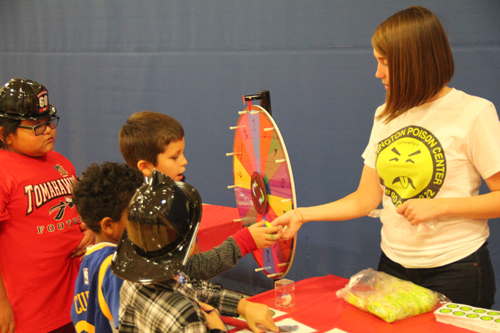 They provided information about poisonings and toxic substances to the children by way of a spin the wheel game. For each spin of the wheel, a child would be asked whether a certain item was poisonous or not if digested/inhaled, and prizes were awarded for correct answers. For incorrect answers, the Mr. Yuk representative would explain to the child how the item was poisonous and potential effects if digested/inhaled. Highlighting the safety fair was the presence of Snohomish County Fire District 15. Children lined up by the scores to meet the firemen, sit in the firetruck and use the fire hose to blast water at safety cones. Washington Poison Center representatives taught kids about about poisonings and toxic substances using a wheel spinning game. 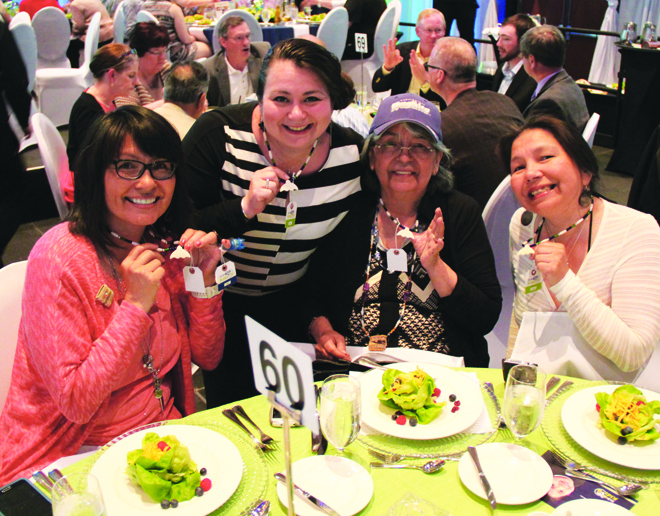 Sheldon family women flaunt their hand-made Boys & Girls Club necklace keepsakes. 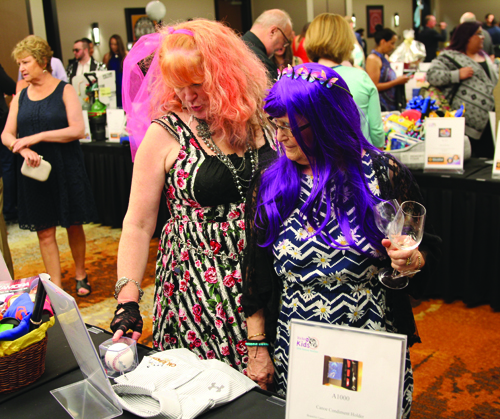 On the evening of Saturday, May 9 the Tulalip Resort Casino’s Orca ballroom was the location for the 17th Annual Tulalip Boys and Girls Club “It’s for the Kids” Auction fundraising event. The ballroom was elaborately designed like never before with a tiered seating arrangement for the record high 650 guests who attended. This year’s theme was in true 12th Man fashion as it was devoted to the Seahawks and prevalent in all visual aspects, from the vivid navy blue and action green colored table dressings and centerpieces to the accent lighting. The Tulalip Boys & Girls Club is the first club of its kind to be built on tribal land in Washington. Established in 1995, 2015 marks twenty years of commitment to the community. The Club serves as a model for those working to improve the lives of young people in surrounding communities. With the success of previous auctions, the Club has not only been able to sustain services, but to likewise complete needed campus expansions that added additional learning space. 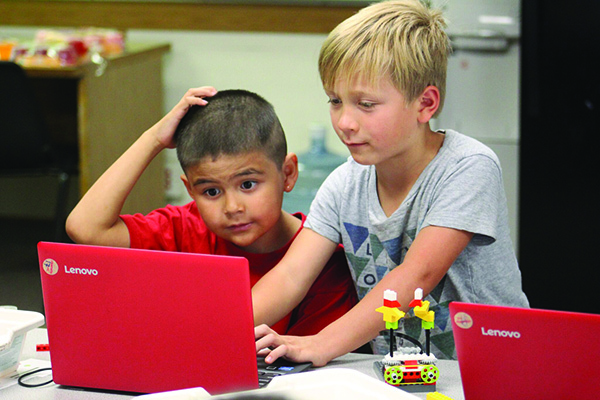 This included spaces like 2014’s all new Computer Learning Center with state-of-the-art technology allowing our kids to stay on par with the area’s best schools when it comes to computer technology. While auction attendees enjoyed the great food, great friends and the great auction items available, they were continually reminded of the hundreds of children who’ll benefit from the night’s proceeds. Video montages depicting Club members, staff, and events were played throughout the evening. A very touching video dedicated to Diane Prouty, or as the kids call her “Grandma Diane”, was shown right before she took the stage to speak on the importance of Tulalip’s Kid’s Café. Through Kids Café, the Club provides healthy, filling, hot snacks and meals to kids after school. Many of the kids who participate in Kids Café would not have an afternoon snack or dinner without the Club. 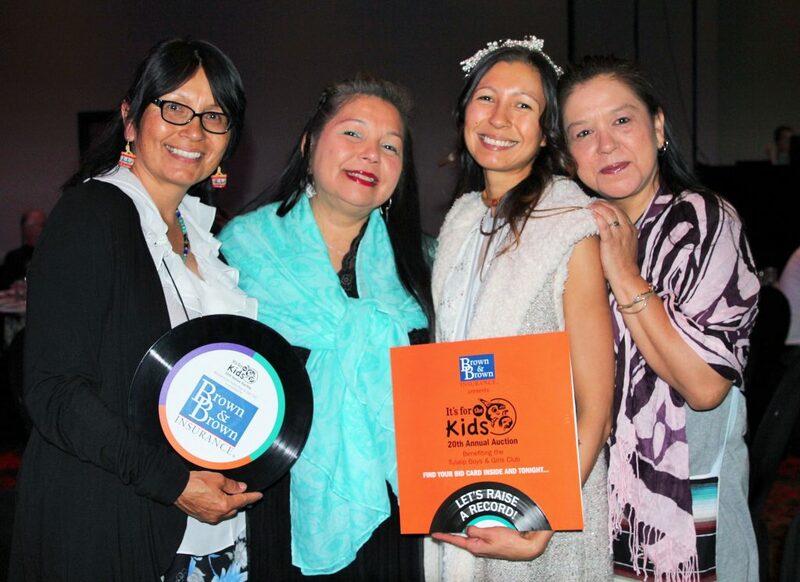 Auction participants showed their generous support by donating a record high $40,945 to Kids Café. That proved to be just the beginning. By the end of the night, the auction had also raised a new record for total proceedings, amassing over $300,000 that will benefit and support the Tulalip Boys and Girls Club. On behalf of the Tulalip Boys & Girls Club, the Tulalip Tribes thanks everyone who contributed to the success of the 17th annual auction. The outpouring of support received each year from sponsors and volunteers is quite overwhelming. As in years past, the funds raised from the auction will ensure that our club not only continues to provide, but improves upon, quality programs in a fun, safe and positive environment for the children who attend throughout 2015 and early 2016. 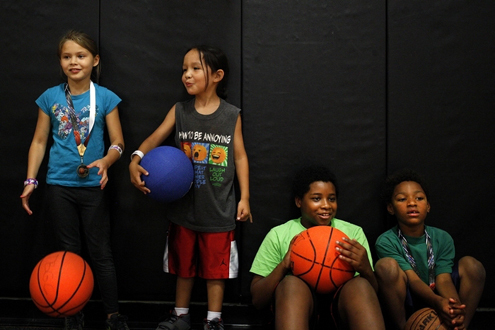 Leno Vela (center), 11, talks with JJ Gray (right), 5, at the Tulalip Boys and Girls Club. TULALIP — Chuck Thacker was working as the principal of Quil Ceda and Tulalip Elementary School when he was approached about starting a Boys and Girls Club on the reservation of the Tulalip Tribes. 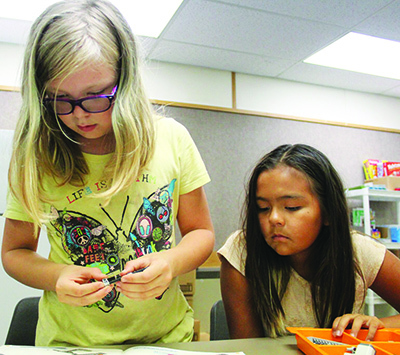 The tribes, Thacker and the Boys and Girls Clubs of Snohomish County all saw the need for a safe after-school program targeted at tribal youth. Thacker would contribute his leadership and experience working with kids, Boys and Girls Clubs of Snohomish County would provide the model, and the tribes would provide the startup money and location, as well as the kids. The Tulalip Boys and Girls Club opened in 1996, the first club located on an Indian reservation in Washington and one of the first in the United States. The Tulalip Tribes continue to support the club financially to this day. Charitable contributions by tribes have become more visible in an era in which some tribes have become financially successful in their business undertakings. But giving has always been a part of Native American culture, even before the 1988 Indian Gaming Regulatory Act created a national legal framework in which tribes could operate casinos on their reservations. In Washington state, tribes such as the Tulalips who run casinos are required to donate a certain percentage of the proceeds to charity. But the tribe routinely exceeds that amount, and even tribes without significant income give back to their communities. “This rule is not new to Indian Country, as it has now been formalized,” said Marilyn Sheldon, who oversees the Tulalip Charitable Fund. “We’ve always been givers,” she said. From left, Georgetta Reeves, 8; Ladainian Kicking-Woman, 6; Tristan Holmes, 11; and Isaiah Holmes, 6, hang out together in the gym at the Tulalip Boys and Girls Club. When Chuck Thacker sat down with Terry Freeman of the county Boys and Girls Clubs and Stan Jones, the former chairman of the Tulalip Tribes, they outlined a vision for the new club: It had to address needs of both the tribe and the surrounding community. The goal was to create a safe after-school program that would accept both native and non-native kids; provide reading programs, other educational activities and sports activities; and remain open as many hours as possible. Most important, it would also provide a meal program. 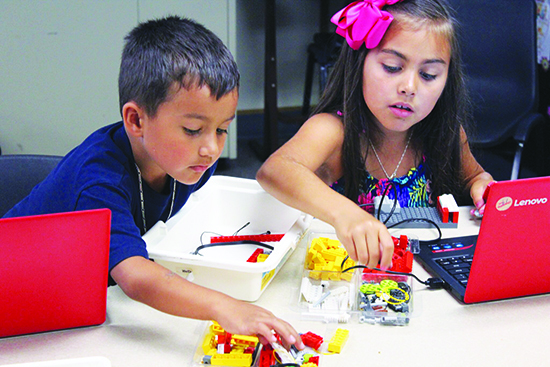 The Tulalip Tribes backed up its support with financial assistance, and has provided the club with financial support every year since, allowing tribal kids to come to the club free of charge even while it has gradually expanded its services to include arts programs and a technology center. The meal program now serves three meals a day to up to 250 youths. During a Pacific Science Center demonstration at the Tulalip Boys and Girls Club, Ashton Rude, 9, looks through animal furs and tries to identify them. The Tulalip Boys and Girls Club is just one organization that’s been on the receiving end of the tribes’ charitable giving. Since 1993, shortly after the Tulalip Tribes opened its first casino, charitable giving from the Tulalips has risen from $273,000 then to $6.9 million in 2013. In the first half of 2014, the Tulalip Tribes has given more than 160 grants to nonprofit organizations, groups or programs both on and off the reservation. They include community groups, the Boys and Girls Clubs, arts organizations, environmental groups, educational programs and specific events, such as the tribe’s annual Spee-Bi-Dah celebration and parade and an emergency grant of $150,000 to the Cascade Valley Hospital Foundation and the American Red Cross to help victims of the Oso mudslide. Marilyn Sheldon recalled that when she was growing up, her own mother and other tribal women in the ladies clubs would support their community with various fundraisers. Tribal giving has been formalized since then, but it still draws on tradition. During the tribe’s annual Raising Hands gala, all attendees receive gifts as a way of honoring them. Children at the Montessori school also spread the table at the end of each year, Sheldon said, and gifts are traditionally given at funerals. “That’s part of the healing of the family, to put all that love and energy into giving,” Sheldon said. Since the Tulalip Resort Casino opened in 1992, a portion of all profits has been donated to charity. Agreements between the tribe and Washington state set a minimum percentage of proceeds that must be given to charity, but the Tulalips now regularly exceed that baseline, said Martin Napeahi, the general manager of Quil Ceda Village, the Tulalip Tribes’ business and development arm. In 1993, the Tulalips donated $273,000 to charitable causes. That rose to $6.9 million in 2013, the 20th year in which the Tulalip Charitable Fund has operated. A committee weighs grant applications, but the members are all anonymous. Each serves for a two-year term and oversees one subsection of the grant requests — for example, natural resources, education, arts or social services. Then, at the end of every quarter, the committee members switch assignments, so no one member evaluates the same subset of applications. “That way it adds to the fairness of deciding who gets funding,” Sheldon said. In the end, the tribes’ board of directors reviews the committee’s recommendation and decides which applications are funded and to what extent. The fall Raising Hands gala is not just a celebratory event, but an opportunity to create more lasting bonds within the larger community. Dignitaries and community leaders are invited to mix and mingle with the recipients of the tribes’ giving. “The beauty of putting that together is you can put other groups together at the same table,” Sheldon said. That, coupled with presentations honoring the work the various grant recipients do, turns the gala into a educational event as well, which creates connections among the disparate groups and may lead to future collaboration. “We are doing the best we can to make a difference in our communities,” Sheldon said. The Stillaguamish Tribe of Indians has seen marked economic growth in the last decade. When its Angel of the Winds Casino and Hotel opened in 2004, the tribe’s charitable giving evolved from a more casual undertaking to a formalized system. “Prior to the casino we didn’t have a whole lot of money to give,” said Eric White, vice chairman of the Stillaguamish tribe. “In fact, we were the ones out there asking for help,” he said. Since instituting a formal giving program, the Stillaguamish convene a committee of tribal members and employees to evaluate grant requests. So far this year, the Stillaguamish have donated about $1.9 million, with some of the larger recipients being relief agencies working in the aftermath of the mudslide. But recipients also have included community organizations, such as a $300,000 gift to local food banks that the tribe made before Christmas in response to an acute need. “Basically our main mission would be to help the folks who are in need,” White said. The Stillaguamish also make charitable donations to environmental organizations, animal rehabilitation services, recreation and health care, especially to the American Cancer Society, which White said the Stillaguamish has long supported. Tucked up in the mountains near Darrington, the Sauk-Suiattle Indian Tribe doesn’t have a casino, other large business enterprises or even easy access to the sea for fishing. The tribe derives its revenue from running the gas station in Darrington and a smoke shop on its reservation, and from leasing its gambling licenses to other tribes that do operate casinos. 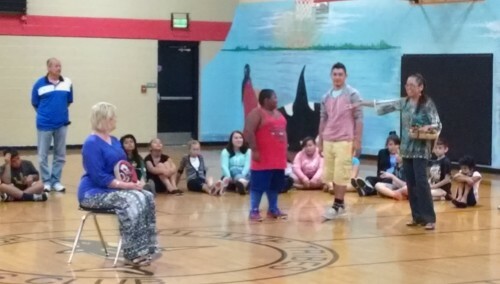 Nonetheless, the Sauk-Suiattle tribe makes a point of contributing to the community. “We do, on a yearly basis, take $30,000, sometimes $40,000 if we have extra, and make small grants to the city of Darrington,” said Ronda Metcalf, the tribe’s general manager. Beneficiaries include the local senior center, the grange, the school and some programs through the pharmacy to help people pay for medication. “We’re not obligated to do that, but it’s something the tribe felt would be a good way to build community with the city,” Metcalf said. When the Oso mudslide cut Darrington off from the rest of the county, Sauk-Suiattle members came together and donated about $5,000 to families affected by the slide, and then came to the Darrington Community Center to lay out a blanket in a traditional form of fundraising, bringing in about $1,100 more on the spot. A committee looks at requests and decides where the need is greatest. If there are many needy causes, the tribe tries to give out something to most of them, Metcalf said. “Tribes have been doing that for a long time, it’s part of who they are,” Metcalf said. This story is part of Snohomish County Gives, a special section highlighting the spirit of philanthropy in the county. Look for more stories on HeraldNet throughout the week and the full section in the print edition of The Herald on Sunday, Aug. 31. TULALIP – “Our club!” the children exclaimed as they greeted Dr. Becky Berg, Superintendent of the Marysville School District. Dr. Berg’s visit to the club was part of a back to school kick off on Tuesday, August 19. Dr. Berg’s tour of the club is part of an effort to create an afterschool community that encourages educational success. 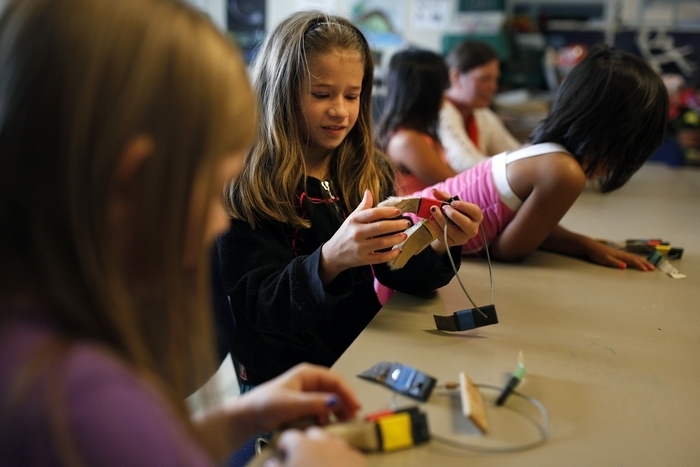 Statistics show that students who attend Boys and Girls Clubs perform better in all areas of learning. Excited by the data from Arlington, Dr. Berg intends to look at similar demographics for Tulalip students in Marysville schools to see if there is a similar trend. Tsoukalas and Tulalip Boys and Girls Club Director, Chuck Thacker, believe there is. 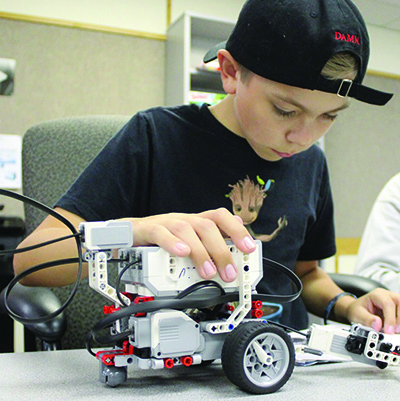 That way of thinking was instilled in Boys and Girls Club kids more than seven years ago by Don “Penoke” Hatch, long time supporter for the Boys and Girls Clubs of Snohomish County. “Kids come here to have fun and to be in a safe place afterschool. But we also want them to learn while they’re here,” Tsoukalas added. 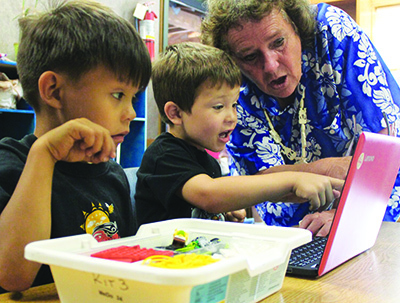 The tour moved into the computer lab as Dr. Berg was shown all of the resources available to children at the club. The newly-renovated lab is complete with brand new computers, two main monitors, and a smart-screen for interactive teaching. Dr. Berg was thanked for her visit to the Tulalip Boys and Girls Club, and was presented with a special gift, a traditional hand drum with original artwork by Heritage High School senior Ayrik Miranda, who is employed with the club through the summer.